Woman’s Christian Temperance Union, "Early History." Pat Ferrero, Elaine Hedges, and Julie Silber. Hearts and Hands: The Influence of Women & Quilts on American Society (San Francisco: Quilt Digest Press, 1987). The temperance movement, advocating abstinence from alcohol, became an important social cause championed by many women in the late 19th century. Earlier in the century women had begun organizing for charitable work and social activism within their church affiliations; subsequent generations adapted tried and true methods and organized in support of temperance, founding the Woman’s Christian Temperance Union (WCTU) in 1874. As with the abolition movement, women used their needles to create items to show solidarity and provide financial support. 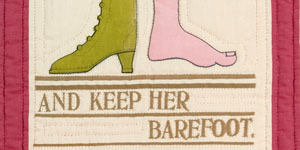 Temperance groups used quilts as fundraisers, charging for names embroidered or inked on blocks “purchased” by the supporter. These quilts were often raffled or auctioned as a secondary means of producing more money. WCTU quilts were also used to raise awareness and a sense of community, serving as decoration for meeting rooms and fair booths. A number of different quilt patterns have, at different times, been attributed to the Temperance movement. They include a wide variety patterns in circulation, such as Drunkard’s Path, Bear’s Paw, Temperance Tree, “T”, and Wine Cups (or Goblet). Blue and white quilts, were often considered temperance quilts as well, however historians now recognize supporters of this cause did not necessarily make quilts in specific styles or patterns, but rather include a variety of specialized commemorative styles and quilts that reflect the fashionable trends of their day.